We would love to hear from you! You can Email us, call us, or write or visit us. 100% satisfaction guaranteed. Return unused product for a full refund, less shipping and handling. Questions? Call 361-241-8851. Thank you! Recipes: If you have created some fantastic recipes using one of our products we want to know! Email us at recipes@texasfirehouse.com. We will try out the recipe and may even post it on the site! 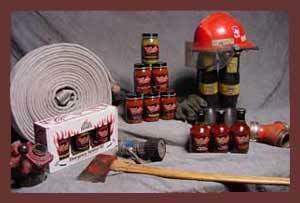 If we post your recipe we will send you a jar of your favorite Texas Firehouse product. Events: If there is an event or competition in your area that you would like to let us know about email us at events@texasfirehouse.com. We are always looking for new awards to win! Products: If you have a question about our products, ingredients, or processes please email us at products@texasfirehouse.com. No, we will not give out the recipes!